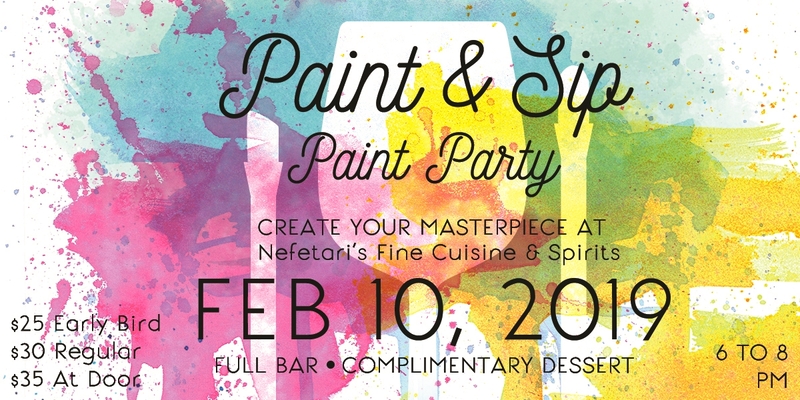 Socialize and make new connections while you create your very own take-home masterpiece! Enjoy wine, cocktails, assorted beverages and desserts while painting along to step-by-step instruction with our experienced and enthusiastic local artist. Visit https://TheFuzzyPineapple.com/Paint to purchase tickets. Do I need to bring anything? Just yourself, we provide everything for you. Cash/card and ID if you'd like to purchase alcoholic beverages. Is there an age requirement? This class is designed for ages 18+. Minors are welcome (13-17) but must be accompanied by an adult painter. BYOB? Laws do not allow for BYOB. Please consume responsibly. Can I bring my own snacks? Sorry, outside food is prohibited. We will provide snacks and desserts. Can a non-painting guest join? To adhere to the fire code and prevent overcrowding, all parties must register to paint in the class. What about refunds? All sales are final. If you need to cancel, you may sell your ticket. I can't paint at all. Is this for me? Yes! The class teaches you how to paint step by step. In 2 hrs, you'll be staring at a masterpiece. Can I take pictures? Pictures are welcome. Recording is prohibited. Please be respectful of the other painters. What should I wear? We use acrylic paint which is permanent. Wear clothes you don't mind getting paint on. What time should I get there? We suggest arriving 15-20 mins before the class begins to prep and park. What are we painting? That's the best part! We don't reveal your masterpiece until you arrive. Gasp. We do drop clues on the event page to pique your interest and give a general theme/color scheme. Get ready for mystique, music, and mimosas.